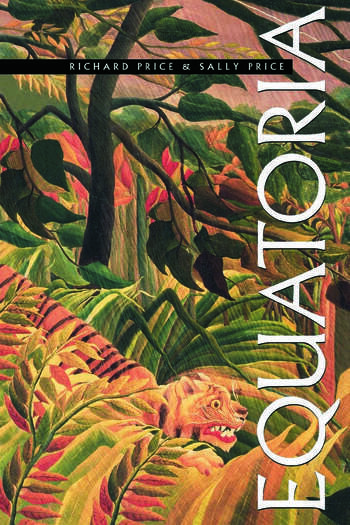 A postmodern romp through the rain forest, Equatoria is both travelogue and cultural critique. On the right-hand pages, the Prices chronicle their 1990 artifact-collecting expedition up the rivers of French Guiana, and on the left, stage an accompanying sideshow that enlists the help of Jonathan Swift, Joseph Conrad, Gabriel Garcia-Marquez, Alex Haley, James Clifford, Eric Hobsbawn, Germaine Greer, and even the noted anthropologist James Goodfellow. Charged with acquiring objects for a new museum, the Prices kept a log of their day-to-day adventures and misadventures, constantly confronting their ambivalence about the act of collecting, the very possibility of exhibiting cultures and the future of anthropology. Probing the nature of museums, collecting, and power relations between "us" and "them," the Prices raise many troubling questions. Richard and Sally Price have been learning and writing about Afro-Caribbean life for 30 years. Richard Price's most recent books are First-Time and Alabi's World. Sally Price's publications include Co-Wives and Calabashes and Primitive Art in Civilized Places. Together they have written Afro-American Arts of the Suriname Rain Forest, Two Evenings in Saramaka and Stedman's Surinam. They have taught at Yale, Johns Hopkins, University of Minnesota, Stanford, Princeton and the University of Paris.